Engine Builder magazine and Speed-Pro POWERFORGED® Pistons are looking for the best example of creativity and innovation, training and education, merchandising and promotion, professional standards and conduct, appearance, solid business management, community involvement, business growth, achievement and victories. If that’s you, congratulations! 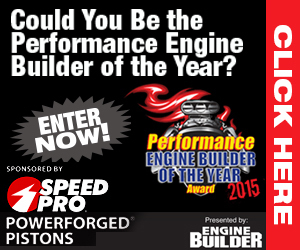 The Fourth Annual Performance Engine Builder of the Year Award will be presented at this year's Performance Racing Industry (PRI) Trade Show, and performance builders of all types are eligible. Engine builders can nominate their own businesses, or others can nominate performance engine building businesses. The entry process is simple: Those making the nomination need to provide basic information about the engine builder being nominated and write a short (300-word maximum) essay explaining why that operation should be considered. From there, all entrants will be reviewed and a group of semi-finalists will be selected. Those semi-finalists will then be asked to provide additional information for judging. A panel of judges, including, representatives from Speed-Pro POWERFORGED Pistons and the Engine Builder staff will select the three finalists and, ultimately, the Performance Engine Builder of the Year Award winner. The Performance Engine Builder of the Year will be announced in a special presentation during PRI, December 10-12, 2015 in Indianapolis.